Cute Card Thursday blog has 'punch drunk' as the challenge this week. You can either use punches or drink (punch) inspired card. I have used some daisy punches and a stamen punch on this card with a cute stamp from Sheena's A little bit sketchy range. The main card is cut using a Spellbinders Grand labels One die and I have coloured the little girl with ProMarkers and I think the backing paper is from one of Joanna Sheen's Cd's. I have loads of paper that I have printed from Cd's that I am trying to use them up before I print more. 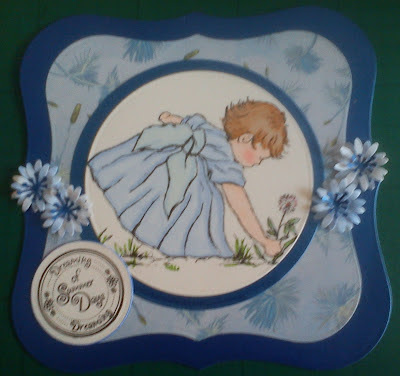 I also used some cloud backing paper that I had printed to make the daisies and used some pearlescent card the same as the base card for the stamens and mat for the stamped image. A Lili of the Valley sentiment stamp finishes the card. Gorgeous card! Love the image, the colours and the fab shape!